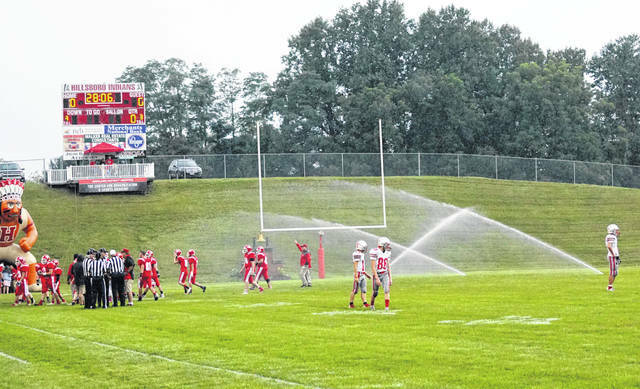 During pre-game warmups at last week’s game in Hillsboro, East Clinton players were doused with a little extra water as the in-field sprinklers came on. East Clinton will honor our men and women in uniform Friday night during Military Appreciation Night during the varsity football game. The Astros will host the Tigers of McClain in a non-league game. Kickoff is set for 7 p.m. All current and past military personnel will be admitted to the game free of charge. The Astros defeated the Tigers 28-14 last season in Greenfield and 33-27 in 2016 at ECHS. McClain’s last win against East Clinton was in 2015. McClain has to be looking at this week’s game in Lees Creek being its last realistic shot at a victory. The Tigers have a tough slate of games ahead of them following their visit to Clinton County. The combined record of the remaining teams is 16-2. Likewise, the first three opponents McClain faced are a combined 6-2. Five of McClain’s opponents are currently unbeaten. Four others have just one loss. The Astros are off to an 0-3 start, just like the Tigers. East Clinton lost last week to unbeaten Hillsboro 49-0 on a rainy night at Richards Memorial Field. East Clinton had 89 total yards on offense and turned the ball over three times, including on their first offensive snap. Jared Smith was the top ground-gainer, picking up 56 yards on nine attempts. On defense, Todd Wedding led the Astros with eight tackles while Tristan Burkitt had seven tackles.